No, I am not being rude. Maybe you’ve seen the t‐shirts. Anyway, it’s an official slogan that was adopted by the Austin Independent Business Alliance. And keeping Austin weird is fun. When I was there a couple of weeks ago for a book launch, I had the grand pleasure of staying at the Driskill Hotel. Yes, I have a weakness for historical and haunted hotels. Unfortunately I did not meet up with any ghosts while I was there, but I did spend a lot of time walking around downtown Austin. If you are familiar with the neighborhood, I walked up and down 6th Street, Congress, etc. My Dear Friend and I walked carefully. To avoid all the scooters . Downtown was crawling with them. Apparently you only need the right app on your phone to rent one. Both citizens and tourists were riding them around the downtown area seeing what there was to see. Then when folks were done, the scooters were left on the sidewalk. There seemed to be an amazing lack of rules to this. Kinda like bumper cars except that half the folks were going 15 miles an hour on two wheels and the rest of us were walking on two legs. Do you notice the nice gent in this picture driving his scooter down the street? Well, most scooter riders weren’t like this nice person. 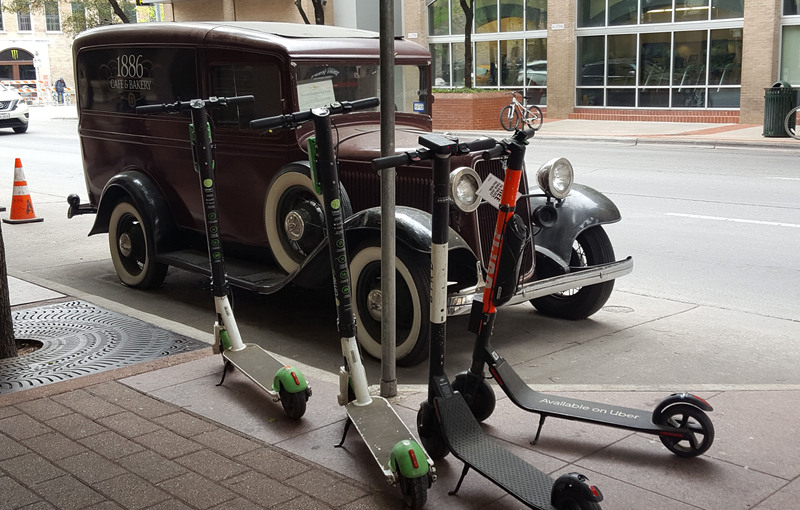 Most scooter aficionados traveled in packs. Sometimes they traveled on the streets and sometimes on the sidewalks. Sometimes they stopped for red lights and stop signs and sometimes they didn’t. Sometimes they went the wrong way down one way streets. They were wild boisterous packs of swarming scooter hordes. In this picture it looks like the red scooters are taking aim with a cannon on a lone green scooter. Of course the statue helped by lighting the cannon. 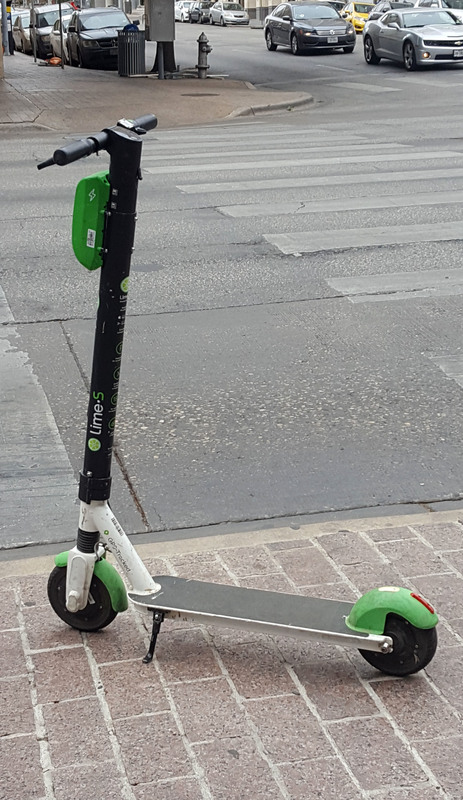 I wonder if the green scooter did some egregious act to rile the ire of the red scooters? I asked, but neither the scooters or statue would talk about it. Many of the fun loving speedy scooter critters were young. I’m guessing a lot of students and recent alums from the University of Texas cruising the bar scene on 6th Street. But I also saw a lot of grey hair flying in the breeze as a gaggle would soar past. Was this part of a mid‐life crisis ritual? 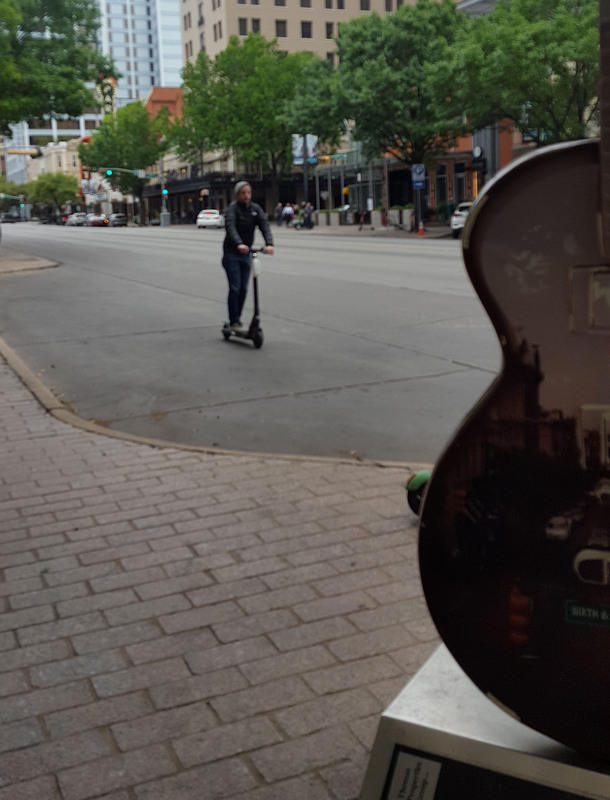 Go to Austin, ride a scooter, drink beer and bemoan a lost youth? I only got almost hit once. According to the traffic light, I had the right of way to cross the street. I began walking, my Dear Friend tugged on my arm. I stopped just in time to see a woman careening around the corner. And finally I leave you with this picture. 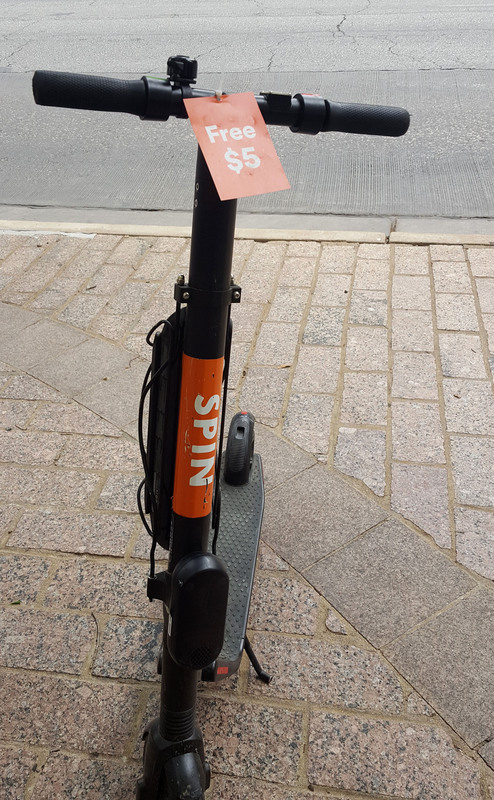 Was this scooter on sale for $5? Was it free as long as it was adopted into a good home? Who can tell. Maybe there were rules to this sport that I just didn’t have time to learn. Back in Houston we don’t have scooters flying around the streets of downtown. No one wants to keep Houston weird. Thank you for this post! 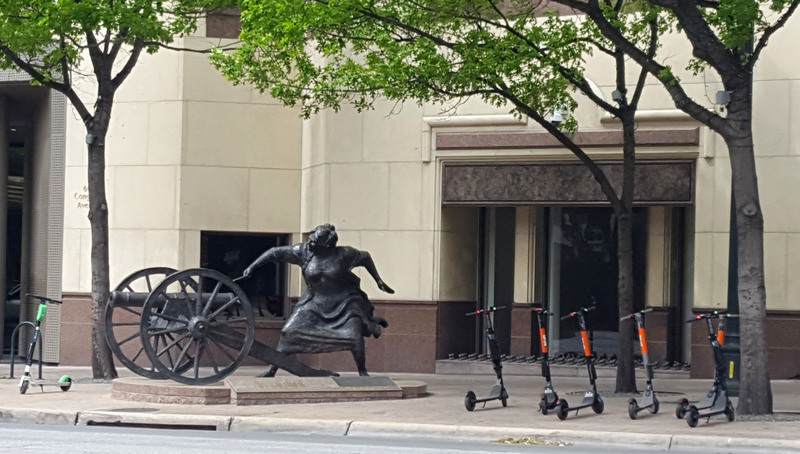 I, too, was in Austin recently and was terrified of these scooters. They need to be regulated. Period. I’m not being rude either but I am for ensuring public safety. If you choose to zip around on a scooter with no helmet and you get hurt, it’s on you. If you choose to zip around on a scooter and you hit..injure and even kill…someone else, it’s on you. Austin is a lovely, weird city. It should be a safe one, too. Previous PostPrevious When the Road Goes #&$^%! !